The coming out party for Nail Yakupov happened last season. Solidifying himself as the best player on the Sarnia Sting, the flashy forward posted 101 points, leading all rookies in scoring by a whopping 18 points – the next closest being linemate, Alex Galchenyuk. The dynamically offensive winger has been the focal point of much hype during the off-season. Questions were raised: Can he do it again? Is he a one-hit wonder? How many points will he score this season? 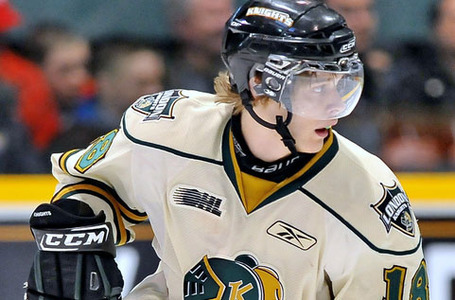 Will he be the OHL’s best player? How high will he get drafted? Is he better than Ovechkin? This year’s NHL draft brings about a lot of talent, as it does year after year. However, the crop of Russian players is not as copious as years past (most noticeably the 2010 NHL Entry Draft). You will not find the likes of a Burmistrov, Tarasenko, Kuznetsov, Kabanov, Galiev, or Kitsyn. But a new breed of Russian hockey player is quickly coming into the fold. The two notables in this year’s draft are, the OHL’s, Vladislav Namestnikov and Alexander Khokhlachev. Most likely first or second round draft picks, these two Russians have taken the next step in achieving their dreams of playing in the NHL by coming across the ocean from Russia to play in the top junior league in the world.